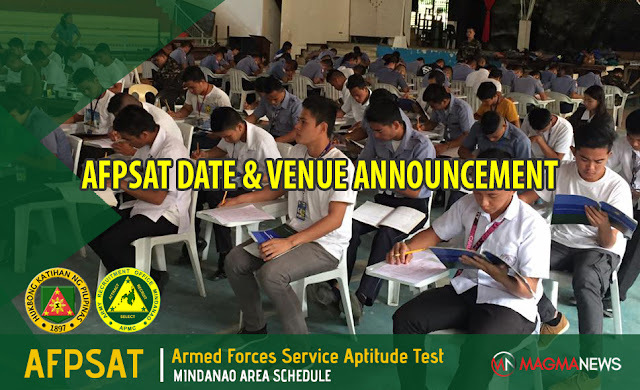 AFPSAT Schedule CY for 2019 | Mindanao Area - Exam News, Reviewer, Military Career, & Everything [MN] . .
Planning to take the next AFPSAT in Mindanao and yet you're not sure when and where to file an application? No worries! We will post here all the upcoming and on-going AFPSAT schedule within the Mindanao region. Register ON-LINE now @ afpsat.afp.mil.ph & have your EXAMINEE NUMBER printed. Bring it along with your PSA/NSO Birth Certificate, Diploma, Transcript Of Records (for college grad/college level), Form 137-A & National Certificate II (for high school graduate). Also, bring valid ID, 2 pcs 2×2 ID Pictures, Mongol Pencil No.2. Attire: White T-Shirt, Maong Pants & Rubber Shoes. Note: For College Students who do not have TOR yet, secure certification from your school.